Bill Maher on Friday said Barack Obama's problem is "he's only half black." He'd be a better president "if he was fully black." In the season premiere of HBO's "Real Time," while chatting with former Clinton labor secretary Robert Reich, the host said, "Isn't Obama's big problem is that he does everything half-assed? Maybe it's because he's only half black." Maher continued, "If he was fully black, I'm telling you, he would be a better president." BILL MAHER, HOST: Isn't Obama's big problem is that he does everything half-assed? Maybe it's because he's only half black. You know? It's that, if he was a, if this, if he was fully black, I'm telling you, he would be a better president. There's a white man in him holding him back because everything is half-assed. The stimulus was half-assed, healthcare is half-assed, let's talk about Afghanistan. 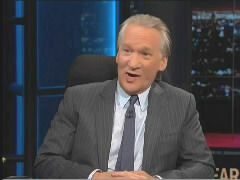 What's really hysterical about this is earlier in the program, Maher accused members of the Tea Party of being racist. I guess it isn't racist to say there's a white man inside the president holding him back. On the other hand, just imagine the uproar if Maher said Obama's problem is that he was half white and that "there's a [black] man in him holding him back because everything is half-assed." It seems a metaphysical certitude the panelists and his audience wouldn't have laughed at that, nor would HBO's management. In fact, Maher might be looking for a job tomorrow for saying something like that. Interesting double standard we have today, isn't it? "I thought when we elected a black president, we were going to get a black president. You know, this [BP oil spill] is where I want a real black president. I want him in a meeting with the BP CEOs, you know, where he lifts up his shirt where you can see the gun in his pants. That's - (in black man voice) we've got a ‘motherfu**ing problem here?' Shoot somebody in the foot."